For 21 days, Rick and I are tour members on one of his own tours: The Best of Europe. We’re trying to combine vacation with quality control and research. And it’s going great! 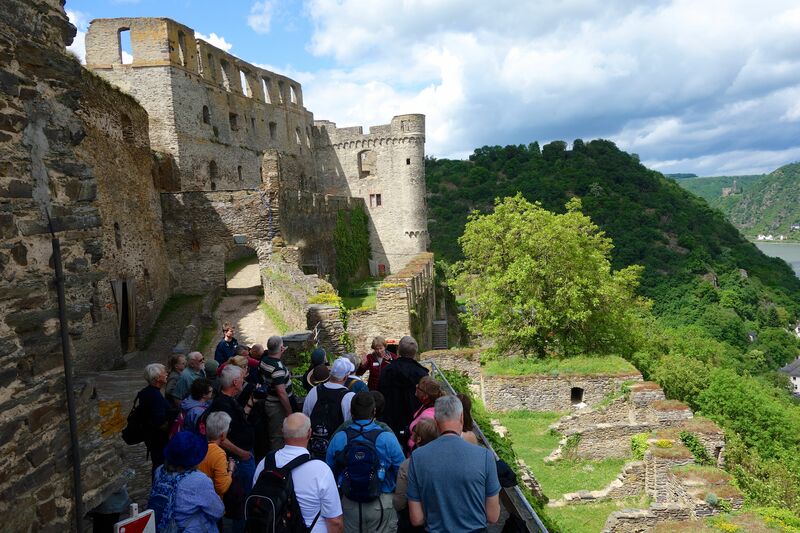 Join us as we traipse from the Netherlands to Germany, Austria to Italy, and Switzerland to France with a terrific tour guide, a skillful bus driver, and 26 wonderful fellow tour members. One of the intimate “Back Doors” spliced among all the blockbuster greatest hits on the Rick Steves’ Best of Europe tour is the town of Bacharach. 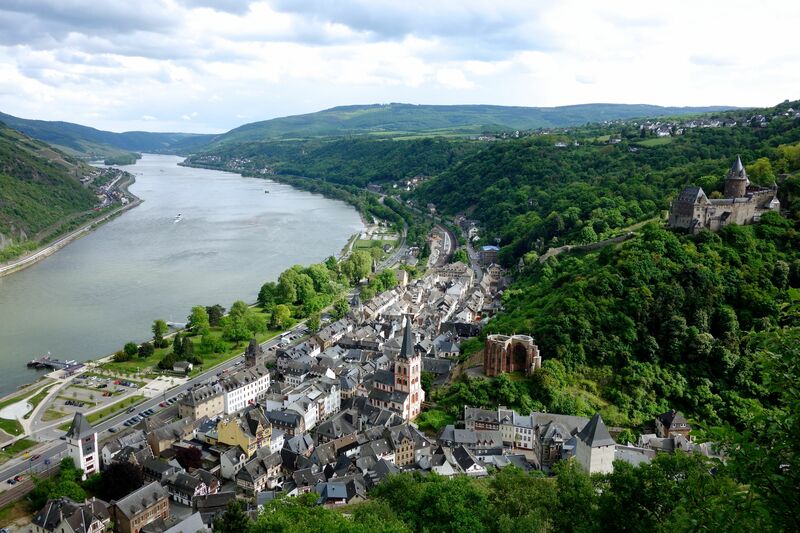 Nestled along the Rhine River, it was once a temporary seat of power for the Holy Roman Empire, when Emperor Frederick Barbarossa went to the Holy Land to join the Crusades and put his brother (who happened to live in Bacharach) in charge. These days, the town has 2,000 residents, and scant remnants of a once-great empire linger in the form of fortified walls, a castle-turned-hostel, and a ruined Gothic church. 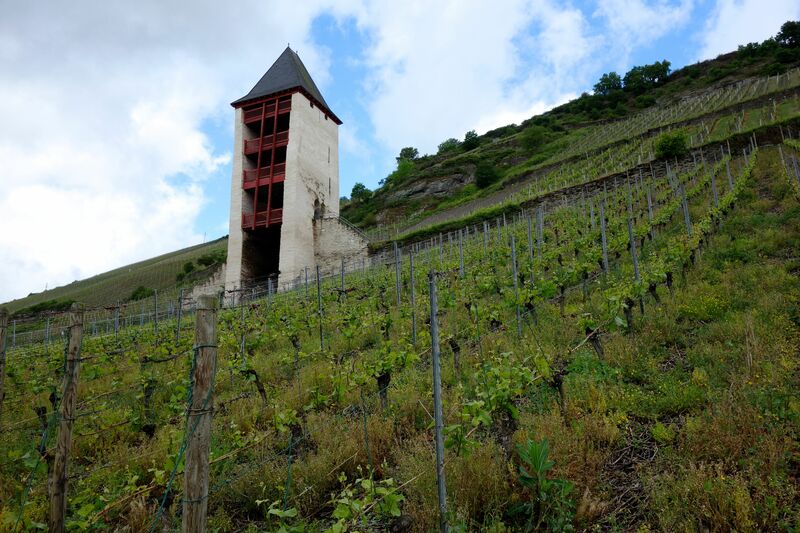 Ages-old vineyards blanket the steep hillsides of Bacharach. Tourism is important here, and many visitors make the rounds as a hop-off point along their Rhine River cruise. The highlights are the aforementioned physical sites, as is the excellent wine (renowned since ancient Roman times), produced from local vineyards that have been maintained by the same families for as many as five hundred years. But for our group, the real treasure of this town is visiting with Herr Jung. Now in his 80s, he’s one of the few residents who can recount living memories of his youth during World War II. As the town’s school headmaster, he has known virtually every townsperson since they were kids. He has a wealth of pride for his small town–combined with an enduring love of America for how his family was treated in the tough post-war years– and is always eager to share his knowledge. Herr Jung, a treasure for Bacharach and any visitor fortunate enough to spend time with him. 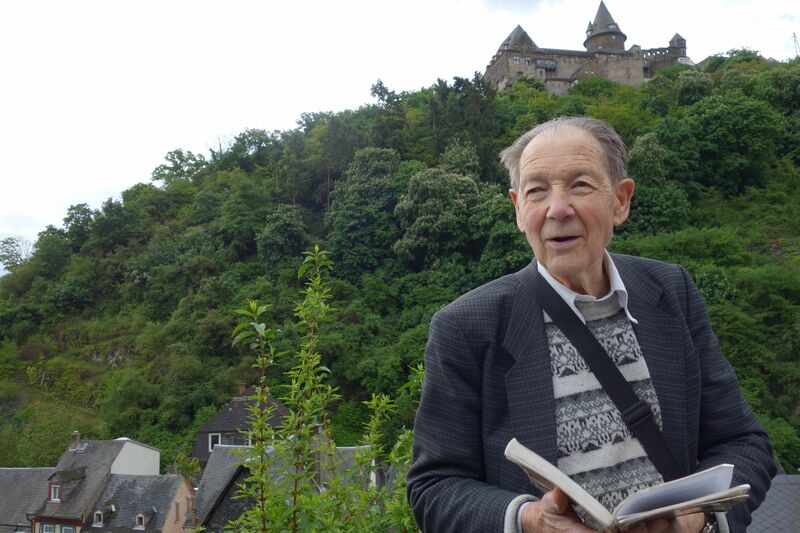 When we meet up with Herr Jung early in the morning at Hotel Krannenturm, a little drizzle threatens to become persistent rain, but he leads us in a round of “Oh, What a Beautiful Morning,” and amazingly, the skies temporarily clear. We shuffle slowly behind him as he guides us through the few, tiny lanes of his town. His eyes smile when he speaks of his former students and the impact they’ve had on him. His chest swells when he shows photos of Serbian and Croatian refugees he has helped over the years, knowing that they suffered in war as he did so many years ago. And you can feel his heart break when he recalls the suffering his Jewish neighbors went through during the war and the tough road to psychological, emotional, political, and financial reconciliation that he and all his countrymen endured in the aftermath of the war. Even at his age, “Mr. Young” (the literal translation of Herr Jung) is heartier than most of us tour members, and he scrambles up the hillside vineyards like a mountain goat, helping the rest of us to get our footing and letting us catch our breath when needed. If ever there were a poster child for staying mentally and physically active for longevity, it would be this man. Receiving a slate memento of their 40th anniversary and their visit to Bacharach, Terri and Dave will always fondly remember Herr Jung. 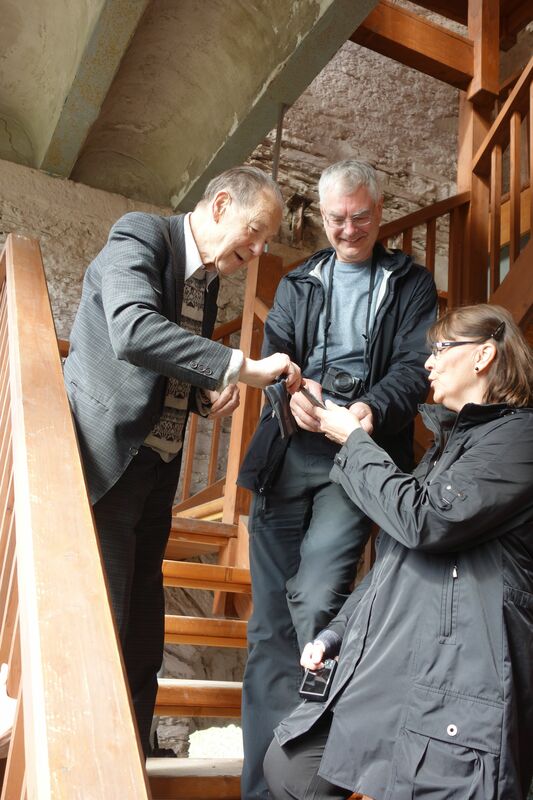 Near the end of our tour, he takes a piece of slate–typical stone of the region that influences the terroir of the local wine and is used for roofing–and inscribes the names of two tour members celebrating their 40th wedding anniversary. His thoughtfulness is a souvenir they’ll cherish for years to come. We’re ready to storm Rheinfels Castle. Later that afternoon, we traveled back in time to medieval Germany when climbed a great hill overlooking the river to storm the now-frayed Rheinfels Castle downstream at St. Goar. In the Middle Ages–and even well into the 18th century–what we know now as the country of Germany was really a collection of princedoms and fiefdoms. Nobles who had land along the Rhine had their own dialects, determined their own system of weights and measurements, and could control transit and commerce along their segment of the river. 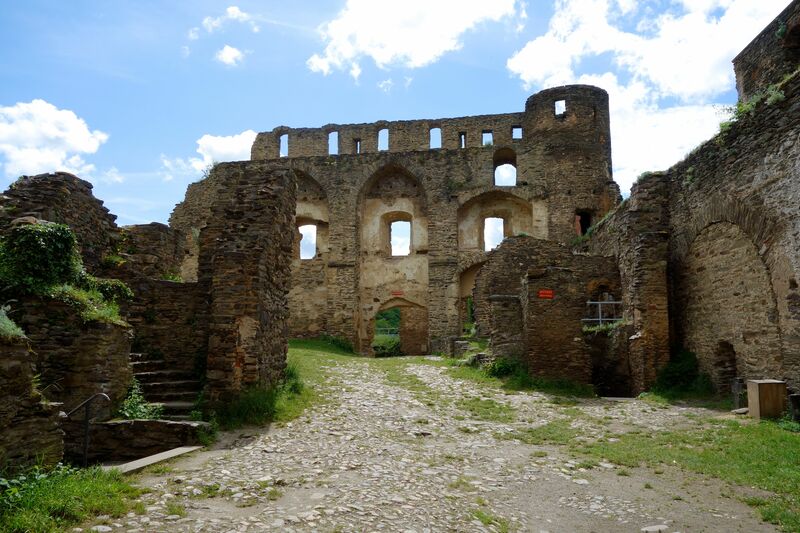 Even in ruins, today’s visitor can appreciate how impressive Rheinfels Castle must have been in its heyday. Built during the 13th-century castle-building boom in the Rhineland to protect landowners, their crops, and the serfs who toiled the land, Rheinfels Castle was among the greatest in its day. Its defensive walls originally encircled thousands of acres, crossbow slits and hot oil chutes were the next line of defense against approaching invaders, and tunnels booby-trapped with gun powder ready to be ignited were the ultimate way to annihilate the enemy. If it ever came under siege, up to 4000 people could safely survive under the protection of their lord. In exchange for their liege’s promise of protection, these folks owed him allegiance, support in times of war, and a large percentage of their harvest. Life was brutal for a peasant who toiled endlessly with zero hope of social mobility and with death awaiting him at an early age. During these bleak and oppressive times, religion was the opiate of the masses. 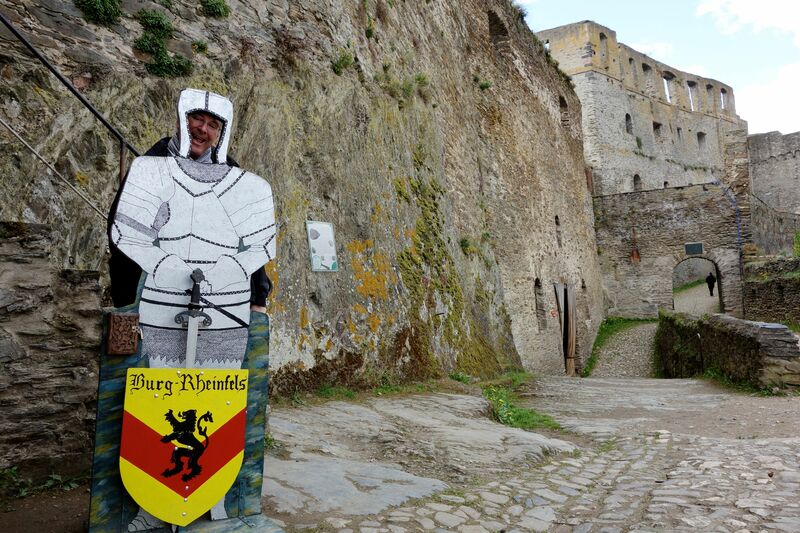 My favorite tourist-traveler and knight in not-so-shining armor. Because it was a pre-cannon age and defense was stronger than offense, Rheinfels was such a domineering stronghold that it rarely had to actually defend itself. Instead, the count who ruled here could concentrate on stopping river traffic and taxing the merchants who needed to get their goods to other parts of Europe. If the captain-merchant refused to pay, he was thrown into the dungeon with nothing but daily bread and water, fellow tax-evaders, and their own human waste for company. Few chose to stay there more than two days and forked over the ransomed tax. Eventually the fortress succumbed to a French Revolutionary army in 1797 and went the way of many German castles: it became a tourist site. Whether on a hill or on an island in the river, castles populate all parts of the Rhineland. 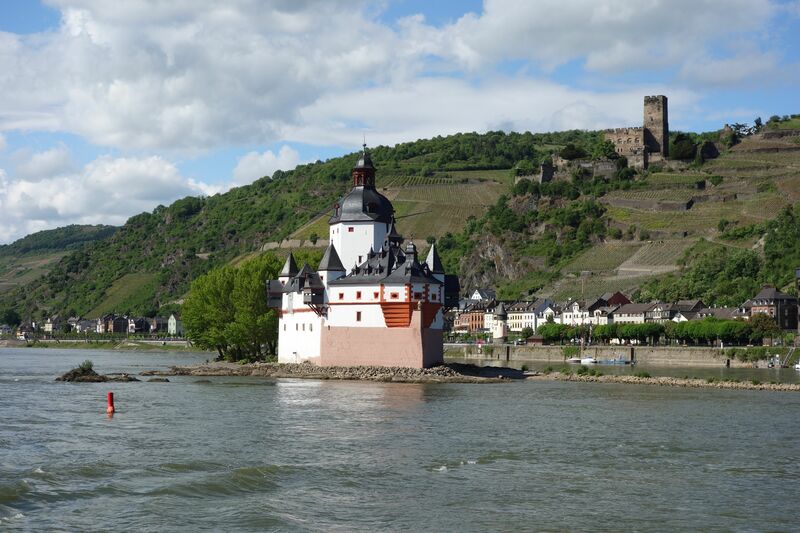 As we cruise our way back to Bacharach, numerous castles polka dot the banks of the romantic Rhine. Passing under the shadows of former princedoms and watching them diminish in the distance, it makes me think how much history this region of Germany has seen and how far this country has come since its feudalistic past: uniting under Prussian influence as a republic in 1871, its aggression and its destruction in both World Wars, and even to now, becoming financially, politically, and socially stable–so much so that Germany is now a leading voice and economic power within the European Union. Germany’s history can be complex and overwhelming to a tourist. And just as Herr Jung’s personal story of life on the Rhine is interwoven with elements of humanity and hope and swaths of brutality and pain, so, too, is the story of the German people. All we can filter out, sometimes, are our broad impressions: mighty castles, unification, war, dominance, destruction, rebirth, and stability. And sometimes that’s enough. But my personal challenge on this trip is to learn to see beyond that. By learning personal stories from people like Herr Jung; putting myself in the mindset of a robber-baron count or a sweaty peasant; grappling with tough issues like war, political upheaval, and death; and discovering how a country’s past shapes its present and its future, I hope to gain a better understanding and a deeper appreciation of all these countries I’ll be visiting for the next three weeks. We use Bacharach as our entry and exit point to our European trips. We stay at Pension Winzerhaus and it is only 2 hours to the Frankfurt airport. What makes Bacharach so nice is that it is an easy place to ditch your jet lag and to do the last packing to board the airplane home. Our wonderful hosts Stefan and Sybille, mentioned for years in Rick’s books are super and now we have to go back to visit them too! Have met wonderful Rick Steves travelers at their B and B. You should see us all at the breakfast tables with the books and maps sharing what to do next! Thanks for the pictures. Someday we have to meet Herr Young. Thanks for the tour!! I enjoyed reading about Herr Jung and your post tremendously!